Beverage manufacturers are increasingly focusing on offering better product with the packaging that is easy-to-handle, eco-friendly and keeps product fresh for a long time. Packaging innovation is becoming norm for beverage companies with smaller package size, situational package types, and multi-packs. See-through packaging is gaining popularity as manufacturers are producing beverages that are visually appealing, that attracts consumer towards the brand. Recyclable aluminum cans and PET bottles for packaging beverages have been the popular packaging choice of manufacturers for quite long time. Meanwhile, plant-based material for producing beverage packages are also becoming popular among the beverage manufacturers. Consumer are also looking for less complicated materials and patterns when it comes to package design. With the rapid rise in e-commerce, manufacturers are focusing on providing safe packaging and spill-proof packaging for beverages. Growing demand for beverages also drives the adoption of automated packaging machinery that are energy efficient. In addition, the consumer preference for aesthetically appealing and attractively designed & labeled beverage packaging is surging across the globe. A recent report collated by Transparency Market Research (TMR) projects the global market for consumer beverage packaging to witness a steady growth. The market is likely to record 5.4% CAGR, in terms of value, between the period 2017 and 2026. Over 65,000,000 tons of consumer beverage packaging are estimated to sold around the world by 2026-end. North America is expected to remain the fastest expanding as well as the most lucrative market for consumer beverage packaging, in terms of value. This is mainly because of robust demand for consumer beverages in the region, along with growing penetration of automation in the beverage packaging industry. However, in terms of volume, sales in Asia-Pacific excluding Japan (APEJ) and North America are projected to register a parallel rise through 2026. APEJ will also remain a key remunerative region for the consumer beverage packaging market, mainly driven by factors such as the emergence of brewing industry, and surging demand for alcoholic beverages in countries such as India and China. Growing concerns regarding use of plastic on the back of their carbon footprint during production, and risk related to metal particles invading the products, has led manufacturers to adopt paper & paperboard for packaging of various edible products, and beverages are no exception. Paper & paperboard will continue to lead the global consumer beverage packaging market in terms of volume as well as value. In terms of value, between plastic and metal, revenues from the latter will remain relatively larger, while sales of the former will record a comparatively higher CAGR through 2026. Through acquisition of product design-specialized enterprises, and new product launches, vendors in the global consumer beverage packaging market are constantly focusing on enhancing their product portfolio. Key players identified by the report, who actively underpin the market expansion, include Honda Motor Co., Ltd., Generac Holdings Inc., Champion Power Equipment, Inc., Yamaha Motor Co., Ltd., Wuxi Kipor Power Co. Ltd., Hyundai Motor Company, Lifan Industry (Group) Co., Ltd., Briggs & Stratton Corporation, Ryobi Limited, Toshiba Corporation, and Subaru Corporation. Consumer beverage packaging market has undergone a tremendous change in the recent years with introduction of new designs and use of eco-friendly material. Convenience, recyclability, shelf-life extension and online retailing are some of the factors playing a crucial role in the changes taking place in the consumer beverage packaging. The trend of on-the-go eating and consuming beverages has led to the production of more convenient packaging with focus on ease to handle feature. With increasing caution among consumers when it comes to food, the trend of clean packaging is gaining momentum in the market. Hence, manufacturers are investing in the research and development of beverage packaging that is recyclable and product-friendly that can preserve beverage in it for a long time. Lightweight packaging is another trend gaining traction in the beverage packaging. Packaging remains a key factor differentiating beverage products. Moreover, manufacturers are also focusing on implementing advanced technology to minimize wastage of packaging materials, and speed up the production process. A new Transparency Market Research report inspects the global market for consumer beverage packaging for the period between 2017 and 2026. The report supports its readers by accumulating and slating all possible strategies with regard to valuable insights for maintaining a proper tempo with changing market dynamics at present and in the near future. The report presents in-depth information associated with the market size, opportunities for the market growth, and trends, restraints & drivers of the market expansion. The report is well-structured and maintains a good flow, providing understanding on all aspects of the Consumer beverage packaging market. Recommendations and analysis of TMR on the global consumer beverage packaging market is an additional benefit offered by the report. An executive summary of the market is delivered in the report’s first chapter, which incorporates insights and forecasts on all the market segments included. Market number such as CAGRs, and revenues for the historical (2012-2016) & forecast (2017-2026) period have been rendered in this chapter. An overview of the global Consumer beverage packaging market has been provided following the executive summary. The overview imparts an incisive introduction of the market, with a formal definition of “consumer beverage packaging” trailing the market introduction. This chapter comprises intelligence related to the market viewpoint of consumer beverage packaging, along with macroeconomic factors influencing the market expansion. This chapter clearly portrays the global Consumer beverage packaging market’s wide scope to the report readers. Subsequently, the report issues chapters on the global consumer beverage packaging market’s segmentation analysis. Insights and forecasts with respect to the market segments namely, application, packaging type, packaging material, and region, have been comprehensively delivered in these chapters. The segmentation analysis of the global consumer beverage packaging market engulfs indispensable market numbers such as the market share comparison, Y-o-Y growth comparison and revenue comparison. Succeeding chapters in the report propound insights and analyses on the regional segments included in the report viz., North America, Europe, Asia-Pacific excluding Japan, Latin America, Japan, and Middle East & Africa. 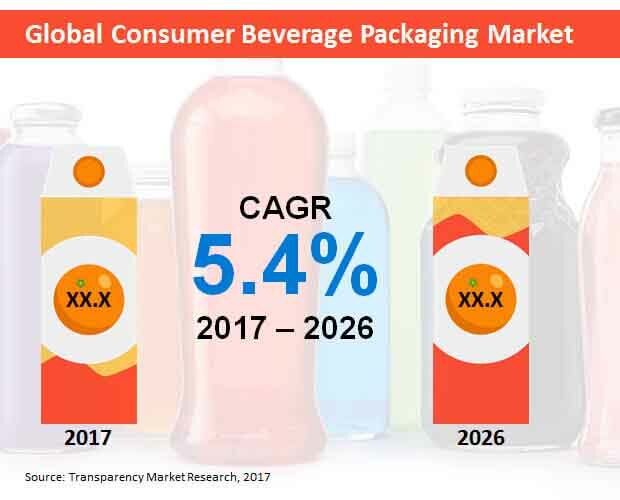 The report has engulfed a chapter on the global consumer beverage packaging market’s competitive landscape, which provides detailed analysis and insights on companies offering consumer beverage packaging. Profiles of key companies, along with a strategic overview of their M&A and expansion plans across geographies, have been delivered in this chapter. This chapter is priceless for report readers, as its enables them in gauging their growth potential in the market and implement key strategies for extending their market reach. This chapter offers key recommendations for both new and existing market participants, enabling them to emerge sustainably and profitably. Intelligence on the market players has been delivered on the basis of their product overview, SWOT analysis, key developments, key financials and company overview. Occupancy of these market participants has been tracked by the report and portrayed via an intensity map.